In Burnaby, British Columbia, it’s the fourth day of resistance in what has been dubbed the Standing Rock of the North. The target of this resistance is the proposed seven billion dollar doubling of the Trans Mountain Kinder Morgan pipeline to carry dirty tar sands oil from Alberta to the British Columbia coast to the Burrard inlet of North Vancouver. More than 60 people have now been arrested, including a former Trans Mountain environmental engineer Romilly Cavanaugh, during similar actions conducted Saturday through Tuesday. The arrests are ongoing. These actions follow the March 10th Protect the Inlet march, where thousands of people rallied against the pipeline and tanker project. Resistance is growing. In Canada a national day of action has been called for this Friday against the Kinder Morgan Trans Mountain pipeline expansion. Now here to discuss the resistance with us is Clayton Thomas-Muller. Clayton is a member of the Treaty Six-based Mathias Colomb Cree Nation, also known as Pukatawagan, located in northern Manitoba, Canada, and based in Winnipeg Clayton is the Stop It At the Source campaigner with 350.org. He joins us today from Winnipeg. Thanks very much for coming back on the Real News, Clayton. CLAYTON THOMAS-MULLER: Hey, thanks for having me. Hello to the viewers. DIMITRI LASCARIS: Clayton, let’s, let’s start by talking about the injunction that has been issued by the British Columbia court in relation to the construction site at the Kinder Morgan facility. What, in essence, does that injunction say? CLAYTON THOMAS-MULLER: Well, the injunction stipulates that anyone who violates the five metre barrier of Kinder Morgan’s Trans Mountain intake reform facility there in Burnaby Mountain would be subject to a civil contempt charge. 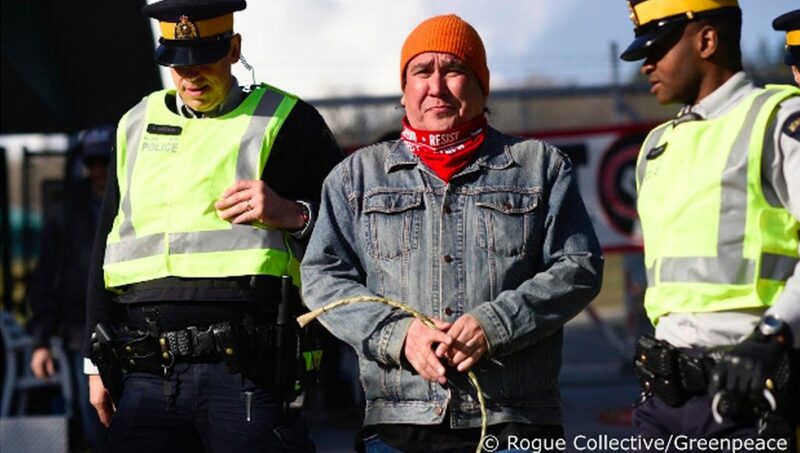 It’s a non-criminal charge with two conditions, which are that, A) They’re not allowed to again violate the five metre zone, nor are they allowed to block traffic coming in or out of the gates at Kinder Morgan’s facilities. You know, over the last many days of rolling peaceful non-violent direct actions we’ve seen over 60 people be arrested doing just that. And I think that right now as I speak to you there are people facing arrest today, again, putting their bodies on the line to stop the Trans Mountain pipeline from being constructed. DIMITRI LASCARIS: Now, you yourself are one of the persons who was arrested at Burnaby Mountain. What were you doing when you were arrested, and how did the police treat you? And also have you been charged with any offence, and if so, what is the charge? CLAYTON THOMAS-MULLER: No. Well, yes, I was one of the first 26 people to risk arrest last Saturday. And, you know, I was arrested. I did sign a promise to appear, which, which of course provided a couple of conditions which I’m not supposed to break, or face more severe charges. So you know, I along with many others will be appearing at some point in early June. You know, through representation, of course, in the B.C. courts. DIMITRI LASCARIS: At the time of your arrest you were, I take it, within the five metre barrier? Or is this something you’re not at liberty to talk about? CLAYTON THOMAS-MULLER: No, we were right there at the gate. The primary gate. There are a few entrances into the construction site where they’re clearing trees to make way for the right of way of the proposed Trans Mountain pipeline. And you know, we were all in there after participating in a ceremony at the watch house, a traditional structure raised by the Tsleil-Waututh elders. This is a very old tradition where when the nation would be threatened they would erect these watch houses to keep an eye on their enemies. So we stopped at the watch house there at the fence of Kinder Morgan’s construction site, participated in in a prayer, an invocation by local indigenous groups, and then proceeded to march to the gate invoking the spirit of the civil rights movement. And then locked ourselves down to the gate using industrial zip ties, which then provoked a response from Kinder Morgan, who called in the RCMP to enforce the injunction. DIMITRI LASCARIS: Now, according to the RCMP, there was a report on the CBC today about this. Three officers suffered minor injuries while making arrests on Monday against, evening, of demonstrators at the site of the expansion in the mountains. The mounties say that one officer suffered a head injury after being kicked, another suffered a knee injury, and a third injured a hand. They seem seemed to be relatively minor injuries. But is there a concern that, you know, as a result of these sorts of things that the police may become increasingly aggressive and potentially force some kind of a violent confrontation such as, you know, the kind of aggression, perhaps, that we saw at Standing Rock? Are there fears about that, any signs that might happen? CLAYTON THOMAS-MULLER: You know, I think one of the things that proponents of this pipeline, and also, you know, the federal government who approved this project early in the Trudeau administration fear is a Standing Rock type situation. You know, the police did report injuries in their enforcement of the of the injunction last night. But that said, you know, the media, the Canadian press as well as the CBC, reported, you know, that they failed to report, rather, that these arrests happened outside of the injunction zone, actually in the crosswalk region in front of the property. And, and I think that RCMP also neglected to mention how incredibly escalated their arrest tactics were. You know, they were very aggressive, you know, against peaceful, non-violent, very passive land defenders, water defenders. And you know, I think there is a bit of sensationalization with the aim of criminalizing peaceful dissent in the actions of the local police stemming from yesterday’s arrests. And of course, you know, the media and proponents of the pipeline are running with that with the sole purpose of criminalizing peaceful dissent and criminalizing the actions of indigenous peoples which are not protest. They are quite simply assertions of territorial jurisdiction well within the means of the nation-to-nation relationship they have with the Federal Government of Canada. 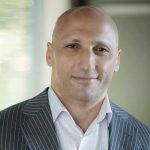 DIMITRI LASCARIS: This is Dimitri Lascaris. I’ve been speaking to Clayton Thomas-Muller, 350.org, about a major series of resistance actions at Burnaby Mountain in British Columbia against the Trans Mountain pipeline expansion. Thank you very much for joining us again, Clayton, and we will be sure to follow this story as it unfolds. CLAYTON THOMAS-MULLER: Thank you so much for having me. DIMITRI LASCARIS: And this has been The Real News from Montreal, Canada.